How to Get Free Energy in Harry Potter: Hogwarts Mystery der Artikel - Versteckte Objekte Spiele! Diesen Artickel einschätzen Just need that extra few energy points to complete a task or a lesson? Well, you can get some free energy points simply by tapping on these objects around Hogwarts! Harry Potter: Hogwarts Mystery can be a really frustrating game mainly because it has a truly frustrating energy-based system which is made even worse because of the very strict time limit. For tasks and lessons that require a full-star (5 stars in total) completion, this monetization system is just enough to force your hand and spend some of those sweet free games that you get for being among the first few millions who played the game. However, if you really want a bit more energy to get that final star for a task at hand and are unwilling to spend any real money to get more gems, we might just be able to help you. 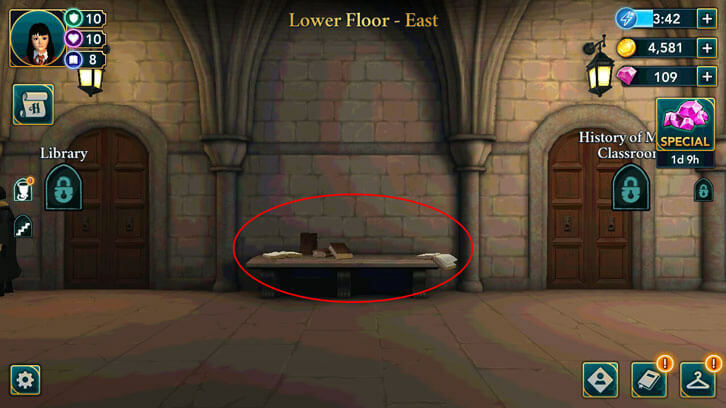 So far, we've found 6 free energy locations scattered all around Hogwarts and we're happy to share! Please take note that these free energy sources will “regenerate”, so to speak, after 6 hours, and if you really want to make full use of these free energy sources, you will need to keep track of the 6-hour cooldown period yourself. The game doesn’t have anything that can help you here. 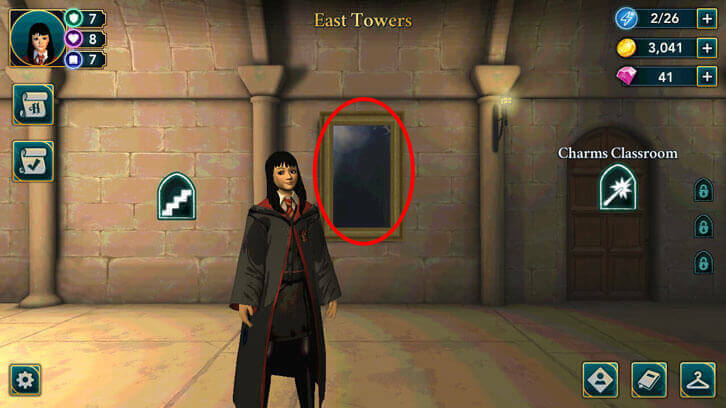 There’s a painting of a night’s sky in between the Charms Classroom and the staircase. Tap on that painting and a lady in a wedding gown will the walk into the frame. This is where you can get a free energy point. 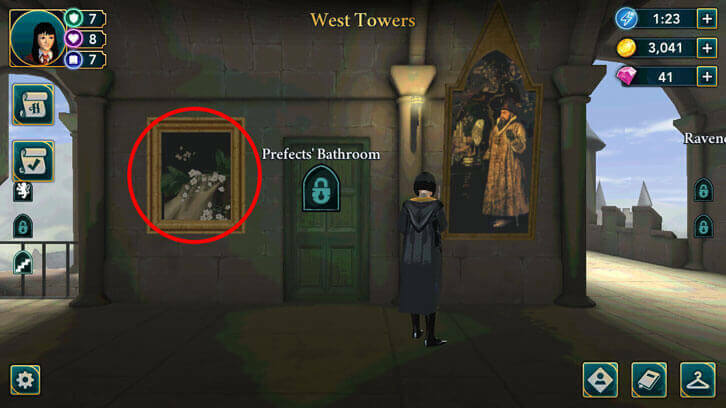 For the West Towers, there’s a painting that looks a lot like a tree stump between the Prefects’ Bathroom and the Gryffindor Common Room. When tapped, you’ll get a free energy point and a hand will pop into the frame to drop 3 oranges onto the flat side of the tree stump. Unlike the other floors, you can get 2 free energy points here. The first one is really easy – you just need to tap on the unlit brazier on the right side of the entrance to the Great Hall to light it. The second energy point can be earned simply by tapping on the middle of the three knight statues/ suits of armor just next to (they are on the right) the previously unlit brazier. The knight in the middle will spring into life and swap his sword for a shield with the statue/ suit of armor on his right. 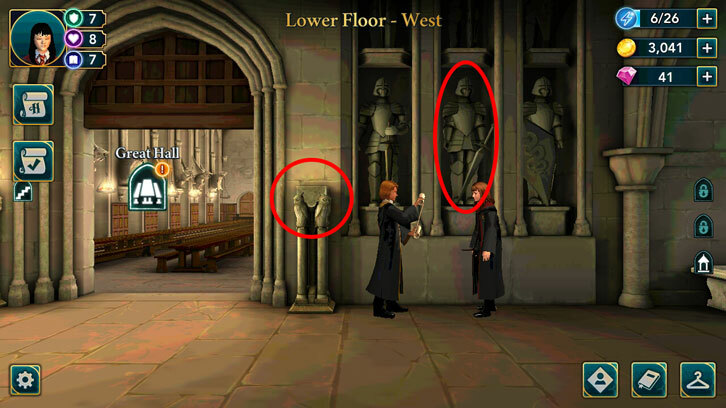 In between the Kitchen and the Potions classroom, you will see a house elf who is leaning against a pillar. Simply tap on him to send him scurrying back into the kitchens and you’ll get your free energy! 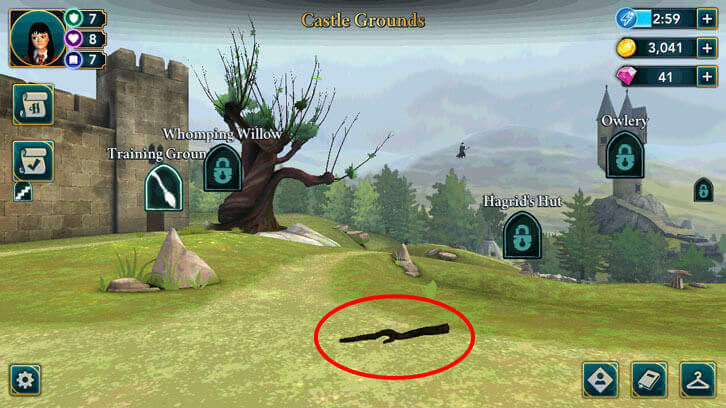 Once you’re at the Castle Grounds, you should see a twig on the ground in between the Whomping Willow and Hagrid’s Hut. If you tap on it, a dog will rush right over, pick up the stick and bundle off into the distance, possibly to play with its newfound toy. You will also gain a free energy point. Once you enter Year 2 at Hogwarts, you will unlock this floor. As you swipe across the place, you should see a stone bench with some books scattered on it. Tap on these books to get your free energy and to magically stack the books into a neat pile. We will update this guide after we’ve uncovered more information.